BRISTOL SHOW 2011: Cabasse shows off iO2 2.1 speaker system | What Hi-Fi? Using a 13cm Duocell mid/bass driver and 25mm rigid dome high frequency unit in a coaxial arrangement, the speaker conforms with all the principles of Cabasse's SCS (spacially coherent system) technology which is claimed to provide " a faithful reproduction of timbres with no artificial colouration or fatigue in long listening, and also provide a soundstage with unrivaled realism and depth"
Its 16cm spherical enclosure, available in pearl or black pearl, is attached to a stable Light Oak or Wenge wood and metal stand for optimum height positioning. 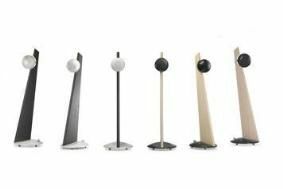 An alternative multi-function base enables shelf or wall mounting, with the sphere attached to the base via a system of magnets which allow it to be swivelled in any direction. A custom installation in-ceiling variant is also available. Bass is handled by the Santorin 25 subwoofer which uses a 25cm drive unit and 250W amplifier module, reaching down to 34Hz. Fully adjustable phase and crossover frequencies enable fine tuning with the iO2 satellites, and a white or gloss black finish ensures aesthetic compatibility. Also on show are the Cabasse MC40 Java SCS floorstanding speakers, available in cherry or purple cherry finishes for £1398/pair, or a limited edition piano black finish for £1698.